Is Riverside's light-covered locale on your holiday must-do list? 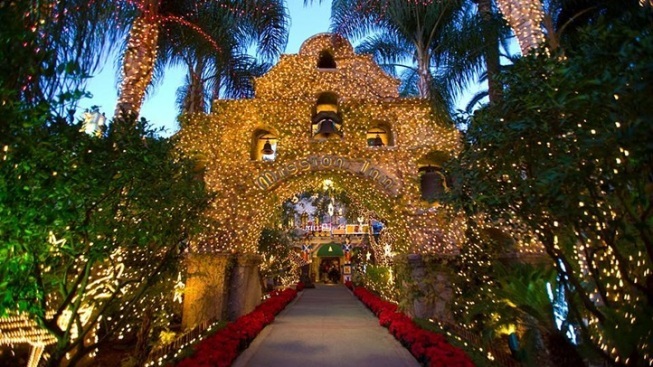 The Mission Inn's annual Festival of Lights is in full glow. If you go, are you staying over? There are whimsical ways to do so. YOU CAN EASILY COUNT... how many round ornaments are in a pack-of-12 box -- spoiler alert, it's a dozen -- and you can probably count how many wee bulbs are on a string (as it says so right on the package). And can you tally up the number of cranberries on the tree, or pieces of popcorn? That's more of a challenge, but we believe in you, and guess you could come by an accurate number in under ten or so minutes, or about the length of three carols. But counting the number of lights now asparkle on The Mission Inn in Riverside? Nope. Not going to happen. Can't be done. Well, it could be done, if you had several weeks, and a calculator- and pad-toting assistant nearby, a loyal companion who could trail you as you reached the high, high numbers. Because the historic hotel doesn't just go for a string of lights or two; there are famously "4 million bright lights" to be found all over the castle-like property. Pointing those out, one by one, doesn't have to be on your agenda, however; you only need to make for the shiny stay-over for an evening of dazzlement. And should you not feel like driving home after all the dazzling images and luminations and holiday scenes you spy? There are packages to be had, hotel-style bed-downs, both of the weeknight variety and those specific to the weekends, as well. THE FIRST THING TO KNOW... is that the Festival of Lights is on through Wednesday, Jan. 6, so choose your night ahead of that date. The Festival of Lights & Delights packages is specific to Sundays through Thursdays, and it kicks off at $359. Included? Look for a nice accommo, a fifty-buck spa credit at Kelly's Spa, Roberts Reserve pinot noir (a bottle to enjoy in your room), and gratis valet. As for the Friday/Saturday or Saturday/Sunday package? That's called Miracle on Main Street, it involves a two-night stay, and it starts at $799. What's on board? That bottle of pinot noir, dinner at Duane's Prime Steaks & Seafood, a pair of Casey Cupcake's, fee-waived valet parking, and, yep, a deluxe room for two nights. Two nights might be a good route, too, if you feel overwhelmed, and in need of rest, after counting all 4,000,000+ lights. You don't have to, though. You may need to count all the ornaments on your own tree, to make sure you've got them all up and in place, but the Festival of Lights at The Mission Inn is all about standing back and taking in the glow-y swath of sparkle in one grateful glance.